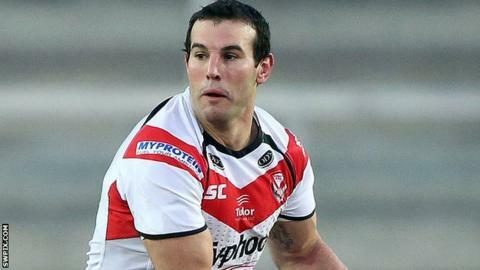 Anthony Laffranchi has admitted that the forward pack of St Helens must improve significantly from their opening-day drubbing by Huddersfield. Head coach Nathan Brown is expected to keep faith with the players that when Saints travel to neighbours Widnes on Sunday. "Personally I'm very disappointed," Laffranchi told BBC Radio Merseyside. "I'm sure I can speak on behalf of the rest of the forwards - we were definitely below par." The Australia international front-rower added: "The beauty of it is that it's round one. Not that you ever want to put a performance in like that, but if there's a time of year to rectify it, it's now." "We've got a great roster that hasn't changed too much," continued Laffranchi. "If anything, we've added some more strike to it. "The fans have got every right to be disappointed because they're expecting to see a quality St Helens team and we didn't deliver [against Huddersfield]. "The coaching staff had us prepared for the game, but individually we didn't perform to our best." Meanwhile, Laffranchi revealed he is close to extending his stay at Langtree Park, having during the off-season. "We're pretty close," he said. "There are a few minor things to get sorted and I'm really excited about the future ahead."